The Canadian Quilters’ Association held their annual Quilting Conference this past weekend in St. Catharines, Ontario. Quilters from all across Canada participated in lectures, workshops and shopping! Quilt Canada is the National Juried Show held during the annual conference. This year they introduced a Modern Quilt category. I submitted three of my modern quilts and all three were accepted into the show! My mother, sister and I went to see the quilts at Quilt Canada on Saturday June 14th, the very last day of the show. The caliber of the quilts were outstanding! I was especially interested in the Modern Quilt category as I had three of my modern quilts accepted. First place: Leanne Chahley for Sunset. Second place: Terry Aske for Shades of Gray. Third place: Doris Lovadina-Lee for Icterine Strata. ME! I am so happy and excited to be a part of such a talent group of quilters! Excellent company to be keeping! All the beautiful quilts from Quilt Canada can be viewed in the Gallery of the NJS 2014. Unfortunately, no photography was allowed at the venue. These are the photos I used to submit my entry. The colours of the quilt are actually closer to the detail photo below rather than the full view above. 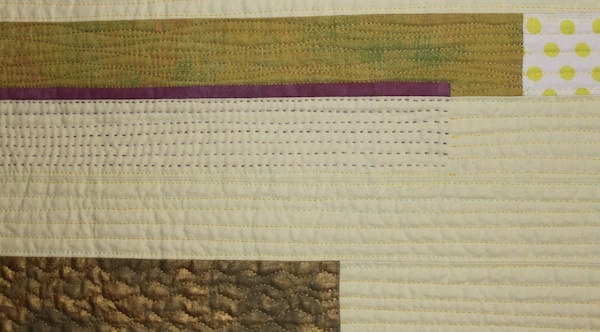 Icterine is a yellowish colour, the colour of the linen that I used for the background of this quilt. It is an unusual shade of yellow with a green undertone. This colour has also been described as ‘jaundiced’! I loved the colour so much that I purchased the end of the bolt and knew I would use it all up. 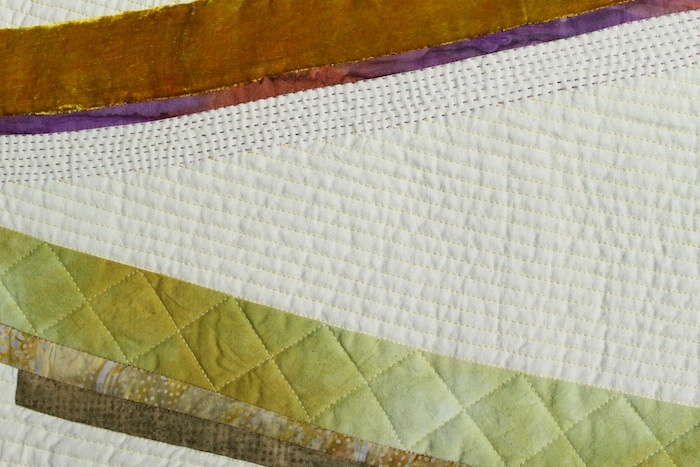 Icterine Strata is the first in a series of three quilts using this linen. The second in the series Icterine Arcs is also complete. The third quilt is in the planning stages and I hope to begin it in the fall. 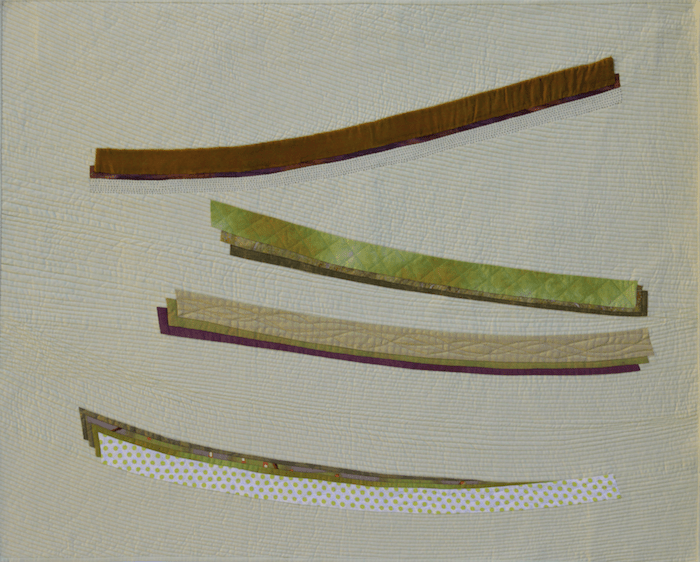 I wanted to make the quilts in this series all the same dimensions and using the same colour palette. The design of the quilts explores the themes of movement, structure and repetition. The quilts are machine pieced using hand dyed and commercial fabrics. 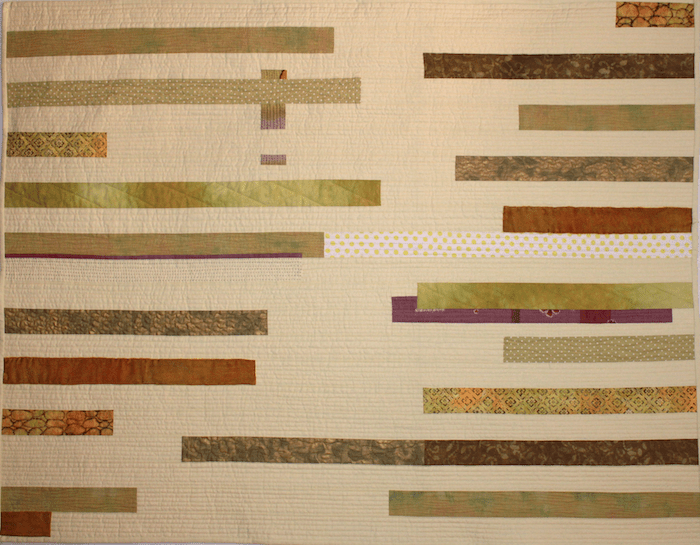 Although mainly machine quilted, I hand quilted areas with a perle cotton thread to create layers of transparency. Doris – I just love your color palette! Your machine quilting looks great, and I love the addition of hand-quilting. I’m looking forward to seeing the rest of your Icterine (cool color name!) series – maybe at next year’s Quilt Canada show? It must have been a real thrill to see your quilts hanging in the show, and even more so to receive an award. Congratulations! Wish I could have been there, too, to see all of the modern quilts. Congratulations on your award too! It was great to see all the quilts in the show. There are some amazing quilters in Canada! I was so surprised to see that my quilt had won – at first glance I thought the rosette was for the quilt hanging beside mine. Your quilt Shades of Gray was eye catching. Love the bright binding. I have the next Icterine quilt planned but not started. Meeting the Quilt Canada deadline is incentive to start soon! Your quilt is beautiful and I love that she is part of a series. I would have loved to see the show in person, my quilt Sunset was sure in wonderful company. It was a great opportunity to see so many gorgeous quilts in person! I am happy to see that a Modern category has been included in Quilt Canada. Hopefully there will be more next year.